Create your very own photo effects from your home PC and amaze your friends and loved ones! All you need is two digital photos and Morpheus Photo Morpher. The latest version lets you upload animations to popular sites like YouTube and PhotoBucket, as well as post your animation directly to Morpheus Galleries, Morpheus Software's social network. With Morpheus Galleries, you can share animations via Facebook or MySpace, and view hundreds of great animations made by other users. Morph your baby photo into your own picture today. Transform your wife into her mother or your husband into one of the Beatles. Morph your son or daughter into a grandparent, or turn your parents into their parents. Transform yourself into a celebrity! Animate photos of friends or family, celebrities, pets, politicians – anyone or anything! Email your animations using the software's Share Animation™ feature. Before you know it, your animations will be forwarded from one person to another! Morpheus' popular "Kitty said what?" morphing video has received over 4 million views and was nominated for the 2007 YouTube Awards. Download Morpheus Photo Morpher now to start making your own video to share with the world and become famous on YouTube! No technical skills required – anyone can make a photo animation in just seconds! 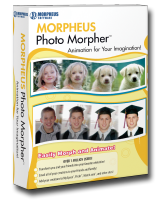 Save morphs in Flash, AVI, Animated GIF and other popular formats. Who knew home digital photography could be this much FUN!